My favourite 18 from 2018 ..
Book Fiction : the Perks of Being a Wallflower by Stephen Chboksy Non fiction: A Life in the Day by Hunter Davies. Song Anything from the greatest Showman soundtrack, Paloma Faith’s Make your Own Kind of Music and Jess Glynne I’ll be there. Gift received : A Chilly bottle, its amazing for hot and cold drinks and always in my bag. Show : National, Wicked Local, the ballet show’s 50th anniversary performance, stunning. Meal out : Thai. Two different restaurants and two delicious meals. Radio Show : Desert Island Discs. This little corner of my house, the kitchen table is my happy place. When we had our kitchen redesigned I knew that I wanted a large kitchen table to be the centre piece of the room. A table where we could all sit together for meals and simply take time to be together. The table itself extends so we can easily sit 8 around it. We have windows on both sides of the kitchen so you can look out into the garden from wherever you sit at the table. There is a fig tree in a neighbour’s garden and its a pleasure to look at all the little birds feed in the tree as you sit at the table. I love to decorate the small window by the table, I always keep my light box with a little message displayed on the window sill and during the year it is decorated for Christmas, Easter and Halloween. The table is always the centrepiece for birthday mornings, with balloons, presents and birthday bunting adorning the table. There is so much family life which happens around this table. All our meals are eaten at the table, even though we have a dining room! I’m a real stickler for all trying to eat together, there’s a no device rule at the table and for the same reason I don’t have a TV in the kitchen either. We do talk lots and its a great way to catch up with everyone. The table is also used for one of my favourite times of day, the after school snack, as its winter, we have hot chocolates and a little snack to warm up and to all just relax a little. The table is also used for homework, the children are not yet at the stage for doing it independently, so I will sit down to help and perhaps write a few to do lists as I keep them company and check on their progress. The table is also used for fun, we play board games here, our current favourite since Christmas is Monopoly, the children love it. If adult friends pop round,we’re most likely to sit and chat around the kitchen table its just welcoming and relaxing, in the summer the back door will be open and the breeze will gently fill the room. Its at this table that I sit and think, plan, write and create, whether it be a little sewing project or some arts and crafts with the littlies. Its also a place to listen to the radio, the station is mood dependent normally radio 2 or 4 with the occasional local station, or to enjoy some music on my phone. When I’m older I hope that I will continue to sit at the table and feel in the wood, the memories and warmth of a family life time of memories. There’s something special to return home after a school run and to sit at my table and to plan, write etc..
Whilst I rarely do the lottery or any gambling, every August I do a bet to predict the 4 winners of the English football leagues. It&apos;s something Mr S and I have done for years as a bit of fun and as we watch the results come through on Saturday afternoon it adds a little bit of interest as you look for the scores of &apos;our&apos; teams. I&apos;ve had success over the years, just one winner is only a few pounds but on my best year I predicted 3 of the 4 and my winnings paid for a long weekend at a spa. Most years I get a little return on my money. I love my football, people are always surprised by my knowledge but I grew up surrounded by boys so it became a way of joining in. I&apos;ve been attending matches since I was 7 and was a season ticket holder at Bristol City for years. The football I know is far removed from the Premier League, it&apos;s the lower divisions with the occasional trip to Wembley for play offs or the Johnsons Paint trophy final. It&apos;s where the footballers are part of the community or where a former student becomes a player of your local team. The special needs school where I teach works closely with our local league team, this is the good done by football clubs often eclipsed by money and scandal. Despite my love of football I happily admit that I don&apos;t study form for my bets the choices are simple hunches and it gives me fun throughout the season . I love this dress, after my wedding dress it is my favourite dress ever. The special events are woven into its fabric and even buying the dress has a story attached! I bought the dress a few days before Christmas in December 2000, I needed, fancied a new dress for the Christmas party at Mr S’ golf club and dashed to the shops on the afternoon of the party. It was a lovely time in my life and definitely a very special season of Christmas sparkle, it was our first Christmas in our new house, my Nan was spending what would be her last Christmas with our family and Mr S and I got engaged. When I walked into Monsoon I saw the dress and loved it. It was the only one I tried on and it fitted perfectly, when I went to pay for it, it had been marked down to half price! On leaving the shop, I was so excited and happy and I bumped into my favourite ever football player. Now the night before I had been at the derby match, which we had won so I was still ecstatic about the result and despite generally being quite calm and collected I turned into a star struck fan, all I could say to him was how well he had played the night before and that he was my favourite player. After all these years, Scott Murray remains my favourite City player, at least I got to tell him!! I wore the dress to the golf party and felt amazing in it, it just skimmed where it needed to and despite its simple looks it is flattering and looks beautiful on. A couple of months later, I needed a dress for our engagement party, I knew my pink dress was the perfect choice and again felt wonderful wearing it. This dress has always been my go to dress, I have so many photos of it in amazing places, at a restaurant overlooking Sydney Opera House, on my 30th birthday at the London Eye and the Ritz hotel, swaying in the breeze on a Caribbean island. It can be dressed up or down with a pretty cardigan or denim jacket, flip flops or strappy sandals. If I was to choose one dress to symbolise the happy, sparkly me it would be this dress, my beautiful fuscia pink silk dress sprinkled with a few sparkly sequins. On this year’s wedding anniversary card to Mr S, I used one of our wedding photos, I do like a personalised card! We have some amazing wedding photos as we married in Rome and were able to have our photos taken at the Trevi fountain. I felt amazing on my wedding day, bathed in the love of my new husband and my family and wearing the most beautiful dress I have ever worn. My dress was a simple and stylish design by Suzanne Neville called Songbird. I never intended to wear a formal wedding dress, we wanted a small, intimate and relaxed wedding and to dress accordingly. I remember at the time being inspired by Bianca Jagger’s wedding outfit. However I was persuaded to visit a bridal shop to try on some wedding dresses and my friend and Mum came to help. I always wanted my dress to reflect me, I had never dreamed of a fairy tale princess wedding dress, I’m not a pretty and fluffy person. I wanted something simple and stylish which was comfortable for me to be me on my wedding day. I tried a few dresses on and to be honest I felt like a little girl dressing up, they were lovely dresses but not me. However when I tried on the Songbird I really did know it was the one and what I wanted to wear to my wedding. Twelve years later I still know I made the correct choice, I smile when I look at the dress in the pictures and remember how special it made me feel, the touch and fall of the silk, the perfect fit and the simplicity of the design. I kept my accessories very simple, pearl earrings and a necklace and a tiara in my hair and the look was perfect for our Roman wedding. My dress is now packed away among tissue paper in a special box, perhaps one day Little Miss will want to try it on or perhaps on our 25th anniversary we’ll have a party and I’ll display it or have it altered for the more mature me. 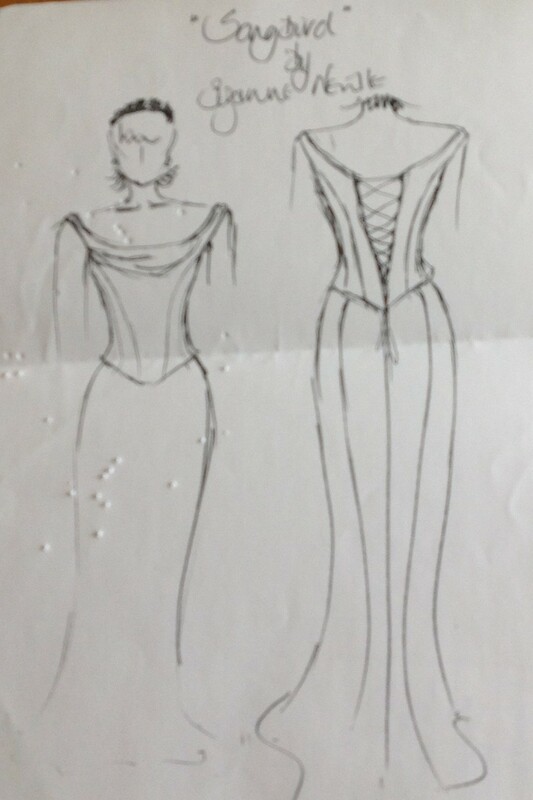 This is the sketch the shop gave me when we ordered the dress to help with the accessories. Its in my Mum’s memory box as she and Dad very generously paid for the dress. I’m sure the pin marks come from pictures and inspirations being pinned to it.